The nurse applied a series of numbing drops to my eyeball, each stronger than the previous. The doctor clamped my lids back with a metal tool. I felt a bracket hold my eye down and someone in the operating room gave the order, "Suction." A whirring sound commenced and my eyeball felt like it was being sucked up and out of my skull, elongated like a green grape between a Roman emperor's fingers, ready to burst. The bright blue-white light grew closer. As the pressure killed circulation in the eye things went black and I felt an arcing slice in the surface of my cornea—I did not move my jaw or tongue or mouth, but deep in my throat I uncontrollably whimpered, "THAT HURT!" and hoped no one heard me. I hoped the other eye would not feel the same. It did not, as the drops had actually taken full effect by the time it was sliced open with a beam of light. The rest was, as they said in the brochure, physically painless. I went for a free consultation. Their office was like any other doctor's office, with one exception. In the middle—behind a giant glass window that everyone in the waiting room could see—was an operating chair situated in between giant boxy machines. They had overhanging beaks positioned as if ready to feast on whoever was strapped into the seat. I was surprised to discover when I went in later that others were getting the basic surgery. I winced as one lady's eye was cut by a scalpel in a device akin to a carpenter's plane. Another lady—whose husband was getting it later depending on how hers went—complained about night vision problems but didn't opt for the costlier halo-reducing procedure. I found this astounding considering the banners on LasikPlus's site offering 0% financing. Someone asked the nurse what the difference was between the cheap and the expensive LASIK and she said something that might not have been exactly endorsed by the company: The expensive one was like high-definition TV and the cheaper one was like standard-definition, but they both get the job done. I thought to myself, "Like hell standard definition gets the job done!" Yet everyone in the room nodded as if they were still using VHS at home. On the Saturday before the lasering, I had gone surfing with my contacts but was told to wear glasses for the next three days to ready my eyes for the operation. Hard lenses need to be left out for 4-6 weeks before surgery since they greatly affect the shape of the eyeball. Wearing my glasses again, I appreciated the nice titanium frames and ultrathin glass. I realized there was a lot to be said for how glasses made me feel. In 7th grade, I'd noticed difficulty making out the blackboard, but avoided getting them and got through math class by squinting. The teacher reported me to the nurse, and I got stuck with some hideous gold colored ones with horn rimmed earpieces. I felt self conscious in them, almost diminished. That feeling went away as I grew up and earned some nerd pride, but I have always allowed myself to say geekier things and do more socially awkward things when wearing them. I could futz with my phone instead of carrying on in a group conversation, push my glasses up my nose and laugh slightly louder than usual at slightly stupider things, and expect people to chalk it up to nerdiness. I think I might miss this, for all the advantages of having laser-enhanced vision. On the day of the operation, the doctor spoke to the patients in the waiting room. The entire procedure would take about 15 seconds per eye. There was nothing we could possibly do to cause the surgery to fail, but please do not shake our legs. (?!?) Lisa asked me at least 5 times if I was scared. It made me wonder if I looked scared, because I didn't think I was scared and if I looked scared that means I was so scared I didn't even realize it. Which all freaked me out. A lot. Once my corneas were cut open and I experienced that initial pain, I was definitely frightened, and escaped to a corner of my mind where I would not think too much about all the things they were doing to my eyes and what my life would be like if I happened to be the "less than 1%" of patients with vision-reducing complications. I was already in this mental cone of silence when the doctor lifted up the covers of my eyeball flaps using what looked like metal chopsticks, mixing around a stir fry while I watched, first-person perspective, from within the wok. I was shifted under the largest machine in the room, its eye a flashing red/orange light. It reminded me of a Discovery Channel feature on exploding stars. There was a sound, a clicking like that from a Tesla coil, and the smell of ozone, which went on for 15 seconds as the nurse counted down. 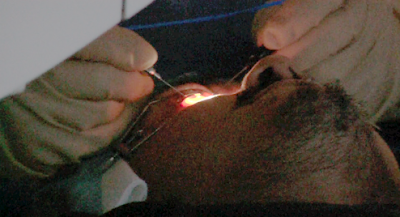 My eyes were clamped, and I felt I was being burned alive (even though LASIK's UV laser does no thermal damage to tissue). I was told not to attempt to move or blink, which of course, makes you move and blink. The muscles in my eye fought the devices holding me steady, and before I could calm myself down, the laser had already stopped. The doctor finished my second eye, and had me sit up. There was fog everywhere and contrast was abysmal, but my vision had improved by measures of sharpness. I slept in the car ride home as Lisa drove, and as the painkillers wore off. The hard part began: I was to avoid all optical stimulation and sleep the rest of the day. At one point, I could handle it no longer and I checked my email. All of it. I was told that the next morning I would have a miraculous, life-changing experience as I woke up without any need for glasses or contacts. Actually, it was not so miraculous. My healing eyes could see somewhat sharply but with a lot of haze. It was similar to sleeping with my contacts in. I took off the racquetball-style eye shield I was to sleep with for a week, and began the steroid and antibiotic eye-drop treatment, which I'd also keep up for a week. I got dressed and went for my check up appointment. And that was when the miracle happened. I got in front of that damn eye chart and, even through the haze, smoked the exam's 20/20 line. Had my eyes been clearer, I would have read the letters on the 20/15 line, too. Not bad for $4K, a laser in my eyes for less than a minute and a day's worth of healing. After I get used to the sharpness, I am sure I will be worried about being one of the few percentage of people who walk away from LASIK dissatisfied. (Wikipedia cites four studies that indicate post-op satisfaction anywhere from 92% to 98%, but that's still a lot of people pissed off.) Even if things go perfectly, they say it will take 3-6 months to heal completely, during which my vision will be irregular. Eyeballs might be dryer at times than I'd want them to be. The biggest problems I have now are the night time halos, which supposedly will improve over time, especially with the wavefront guided method my eyes were carved up with and the terrible, terrible bloodshot I have from the suction device. They say this may take a few weeks to clear up, and while I'm waiting, I have been wearing sunglasses at night and apologizing for them. Annoying. None of this bothers me much, save the fact that newer, better, safer technology will come around sooner or later, and my eyes may end up as out-of-date as back-to-school iPods. There is talk of using the laser to cut the flap, which is of lower disruption to the corneal tissue, to complete the entire operation, soon. And I do not know if my eyes will be forward-compatible, having already been sliced. Still, for now I remain top-of-the-line, and I would gladly endure 10 times the (mostly imaginary) pain of LASIK to gain the quality of eyesight found in elite Major League Baseball pitchers.